Constructed with 304 type stainless steel and reinforced with a satin-polished finish and sound absorption pads, this single-bowl bar sink is built to last. Its sleek and contemporary design make it a great fit for any home. Give your kitchen a clean look and durable work space with this sturdy undermount sink. I am over the moon with this purchase. 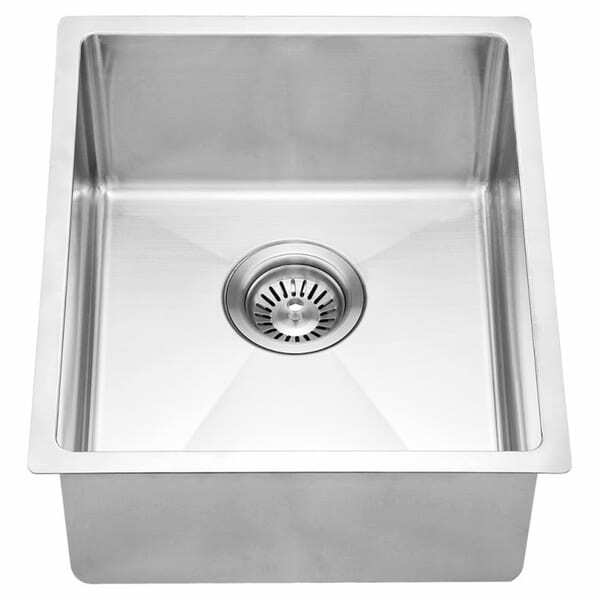 I search high and low looking for a reasonable priced stainless steel sink. I am actually using this sink as my secondary sink off the kitchen. I bought a single bay large sink (also on Overstock). Just the perfect addition to my new contemporary kitchen design. Can't wait to break it in very soon! This was just the under mount sink I was looking for. I wanted a rectangular sink with 90 degree corners for my kitchen island. This is perfect! But with all stainless steel, it gets eater spots. If you wipe it out immediately after use, that prevents the spots. If I don't do that, I just clean it with soft soap and wipe it out with a dry paper towel and it's sparkling clean. Easy and good price. I recommend it. So much more affordable and easy when you are building a house to have access to these products. good quality and good returns of needed. Nothing Wrong Could not use the shape. "Drain is missing in my order"
Please call customer service at 1-800-843-2446 for immediate assistance. "I need overstock Contact telephone"
"What is the minimum size cabinet this will fit into?"